And this distance reading works perfect! Do I have to write something like that in draw ()? And how can I get income distance value as number from which depends displayed image? And should I upload any specific library for this? Do i have to write something also again in Arduino code? Would be great if someone could suggest any examples or codes for this. It plays only photo3. How can i refer distance to income values? I guess that the income is written in last lines data=myPort.readStringUntil('\n'); ?! 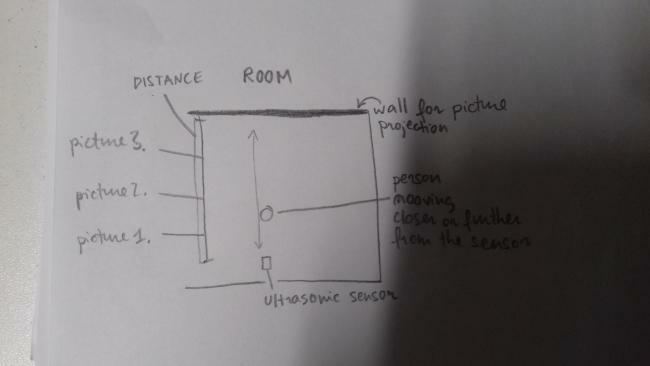 In consol the range of the sensor is from 5 up to 60 (where is the ceiling). After updating the code the picture still is the same one. And even if the data shows more than 20, it plays photo1. When I use println(distance); it shows zeros. I wrote distance=int(data) in draw, but now changed it in setup. Nothing changes. Still zeros and one picture. But previous println(distance) showed the numbers at least.. Could there be wrong datatypes for something? What gives println distance? numbers or zeros? Omg! Don't have a clue how, but distance=int(trim(data)); completely fixed everything! huge thanks! I think I would not get answers in the new forum. read your code slowly and carefully: when you forget to assign a value to a variable, it won’t work. When your if-clause is wrong it won’t work. It’s good that you always showed the entire code when posting so we were always on the same page.